Maureen Mitchell of Innovative Underwriters became part of an elite group honored with the Paul Goodman award by Legal & General America. 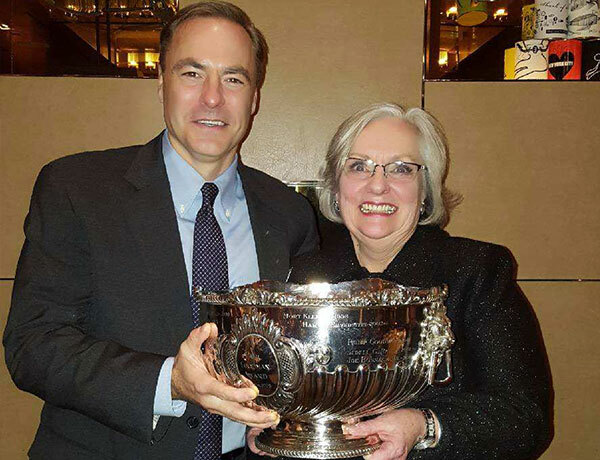 The award was established in 1998 by William Penn Life Insurance Company of New York and is given to a person who reflects the innovative spirit and commitment to the brokerage distribution system exhibited by the late Paul Goodman, the company's former president. Paul Goodman was known for his ability to recognize exceptional performance in the people around him; choosing each year's honoree is Legal & General America's way to truly honor Paul Goodman and his contribution to our industry. Mitchell is a graduate of the College of Mt. St. Vincent in Riverdale, NY in 1974 with a degree in English Literature. As a result of on-campus recruiting, she was one of three graduating seniors hired by New York Life Insurance Company as an underwriter trainee. Mitchell worked at NYLIC until 1979 when she joined American Mayflower in 1980. There, she was promoted to sales and she never looked back. In 1985, Mitchell joined William Penn where she worked in upstate New York and New England. After 5 years with William Penn, Mitchell grabbed at the opportunity to have exposure on a national scale and began working at MetLife. Maureen’s commitment to the New York brokerage community spans her entire career, including her time as a William Penn employee. She is a consummate professional and supremely deserving of this prestigious award. It was an honor to present her with the Paul Goodman trophy. Maureen Mitchell accepted the award from Jim Galli, Legal & General America's EVP, Business Strategy and Innovation and Patrick Bowen, SVP Distribution. Mitchell was joined at the award ceremony and reception by her Innovative Underwriters partners, and her brother and his family. Mitchell currently resides in Manchester, NJ so she can be close to her mom and the beach. She is very active in her church, St. Aloysius in Jackson, NJ, where she serves as a lector and minister.